Looking to add some musical fun to your child’s birthday? Music Together Coastal Melodies can help you make musical memories for your child's special day! Our Musical Kids Birthday Parties will transport you and your guests into the world of musical fun and play. 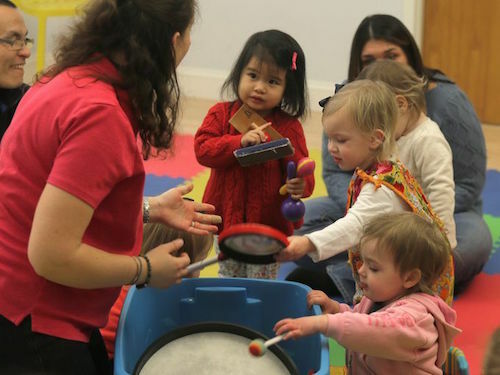 Our certified Music Together® teachers incorporate songs, chants, and finger plays into your child's celebration to make magical memories! We bring plenty of props such as scarves, rhythm sticks, bells, eggs shakers and a collection of instruments for an instrumental jam session, so that all of your guests can get in on the musical fun! We come to you! All of our musical parties can be held in the location of your choice. While indoor spaces tend to work best, our activities are easily adaptable for outdoor locations as well! We bring all the necessary equipment and can include favorite songs, instruments and props upon request! 30-45 minute interactive musical program by one of our trained Music Together teachers. We typically schedule 45 minutes of entertainment but it this depends on the ages of the children, the desire of the client and potential schedules set by the place of the celebration. Initial party package is set for 12 children. We may be able accommodate more children depending on the space for an extra charge. All ages are welcome but our activities are geared towards children from infants through age 8. Parties require a signed contract and $50 deposit to secure date. This deposit is applied to the overall charge of the party and the balance is due in full the day of the party, payable by cash or check. Any cancellations made prior to 48 hours before the party date will have their deposit fully refunded. Any cancellations made within 48 hours of the party shall result in a non-refundable deposit. This deposit may however be reapplied to a rescheduled party within 6 months of the original date or used towards class registration with us within that same 6 month time frame. The success of the Music Together program relies on active adult engagement during the activities. The host will be responsible for facilitating adequate parental participation and supervision during the party. Above party package: $175.00 (a $25 travel surcharge will be added for locations more than 25 minutes away from Oakhurst, NJ). Should your space need a comfortable spot for your guests to sit on the ground, use of a removable foam tile floor is available upon request. For your convenience, infant and child-safe musical party favor packages are also available for a small additional charge.